Alfred A. Knopf, New York, 2013. Originally published in the United Kingdom in 2012. 28 pages. Here’s a fun, simple story that families with knitters will especially enjoy. Little Owl usually loves surprises. But when Mommy knits him a scarf, it’s itchy. It’s too long. And it’s far too orange. 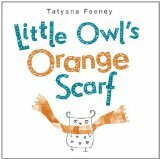 Little Owl tries hard to lose the scarf, but Mommy always finds it – until the class trip to the zoo. Then Little Owl gets the fun of picking out yarn for a new scarf. This time, it’s soft and blue. And readers get the fun of spotting where the old scarf ended up.